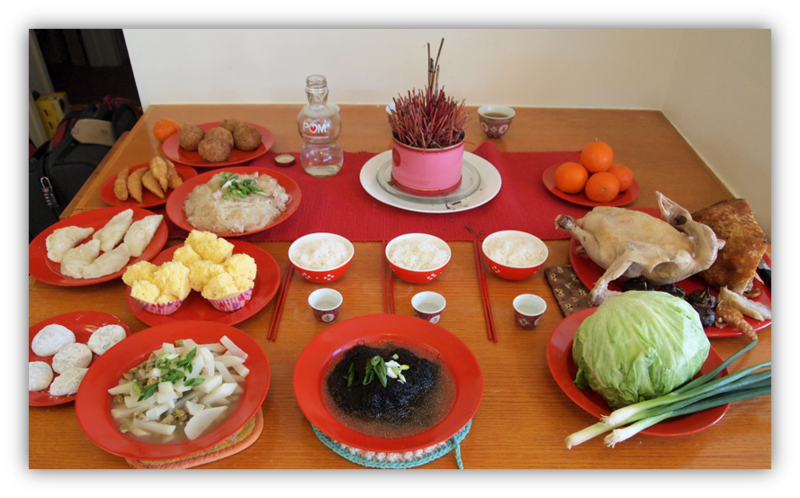 Chinese foods included for traditional offerings made for the ancestors in a home ceremony. Fried rice flour pastries on the left, along with white long life noodles and exploding prosperity cupcakes. Good fortune seaweed in the front (black), which is also signified by the lettuce. It is important that the chicken still have its head on. There are an estimated 3.35 million ethnic Chinese Americans in the US, comprising the largest Asian population in the country. In comparison to the ethnic Chinese in Asia, Chinese Americans tend to have higher rates of diabetes and heart diseases, which is attributed at least in part to the different diets they are exposed to in the US. The traditional Chinese diet tends to be much higher in fiber and vegetables, lower in saturated fat (with much less meat), low in sugar and other sweeteners, and generally well balanced. After they migrate to the US, the first generation Chinese will usually add the dominant American diet to their traditional diets. First generation Chinese immigrants were immersed in Chinese culture prior to their migration to the US. This shapes how they interact with American culture. They selectively adopt some American traits and drop some Chinese traits. Their “Chineseness” is, therefore, measured in terms of the degree to which they drop or maintain their original Chinese traits. Some drop more traits than others, and they may re-adopt traits later in life. Second (and subsequent) generation Chinese Americans are those who were born in the US. They grow up immersed in both Chinese culture (mostly in their home) and in American culture (mostly in public spaces, including school and work). Their “Chineseness” is measured by the degree to which they engage with Chinese culture, with some engaging more than others. Among the ways that individuals perform their Chineseness include (1) speaking Chinese languages, (2) associating with Chinese people, (3) participating in Chinese cultural activities, and (4) eating Chinese food (Tsai, Ying & Lee, 2000). In general, Chinese Americans tend to eat more convenient American foods for breakfast, Chinese food for lunch and dinner at home, and a mix when eating out. First generation Chinese American prefer Chinese food when eating out, whereas their children tend to prefer Western convenience (fast) foods, causing a generational conflict in identity. For some second (and subsequent) generation Chinese Americans, traditional Chinese foods can be an experience of “otherness”, similar to that encountered by tourists visiting an exotic (different) culture. “Food Tourism” may be applied to any experience in which one crosses cultures to experience the palate of the “other”. Cohen and Avieli (2004) suggested phenomenology of food tourist experiences, range from food neophobics (afraid of new foods) to food neophyllics (passionate for new tastes). Four possible types include (1) those who are only interested in pleasure eating and have no interest in local ethnic food authenticity (recreational mass tourists), (2) those who will try local cuisines only in a safe tourist setting (sightseeing or gazing tourists), (3) those who will try local foods in establishments frequented by locals (experimental or participant tourists), and (4) those tourists who totally subsist on local ethnic foods and nothing else in a culinary “switching of worlds” (existential or identity tourists). Food authenticity parallels debates in tourism authenticity. There are several way to consider this, including (1) Objective authenticity, which is the degree to which the food is a replication of a heritage cuisine or a dish as found in its homeland; (2) Subjective authenticity, which is the degree to which the food is perceived as authentic by an individual (which is the basis of most online restaurant reviews); and (3) Existential or experiential authenticity, which is a more rare peak or euphoric (or even spiritual) food experience, separate from objective or even subjective interpretations. This last category may apply mostly to fusion foods that are more art than a replication of a food tradition. (1) Chinese American cuisines, which are versions of Chinese food that have been adapted to the dominant American tastes. These are mostly safe for food neophobics recreational and sightseeing eaters, because they are similar to what they are familiar with. Chinese American cuisine first emerged in the late 19th century, when Cantonese immigrants began cooking for railroad and mining town workers in the western US. They adjusted their cooking for American palates, with much of what is found in Chinese American restaurants today being formalized by the 1920s on menus across the country. These foods include chop suey, sweet and sour pork, orange chicken, fried won tons, and fortune cookies. Mongolian barbeque is a more recent version of this approach. The success of this menu has made Chinese food one of the four most popular ethnic cuisines in the US (along with Mexican, Italian, and American). (2) Real Chinese cuisines, which are more authentic to the variety of cuisines in China. These foods are sought out by food neophyllics, including experiemental and identity food eaters. Many of the Chinese restaurants that serve a significant first generation clientele will have a separate menu in Chinese only, which contains more of the “real” Chinese food tastes. Unlike Chinese American cuisine, Real Chinese dishes have: a greater variety of both leafy and root vegetables; meats serve in smaller pieces, except for fish which is usually whole; more soup varieties; steamed and boiled foods more than fried; and family-style eating. Some signature examples of real Chinese foods are: chicken feet and other Cantonese dim sum (dian xin) dishes; clay pot cooking; Peking duck and pork skin dishes; tofu and soy milk; and herbal soups. Many of these are found only on the Chinese language menu. (3) American Chinese cuisines, which are the home cooked dishes of Americans who are of Chinese ethnicity, and which are seldom found in restaurants. This is because the dishes are handed down through family members and reflect regional and local traditions brought to the US by first generations immigrants. As such, the dishes are very distinct for each sub-ethnic group, or even each family. For Chinese Americans, these are the most authentic dishes because they offer a sense of nostalgia and connection to a personal past. Eating these foods, more than the others, strengthens connections to ethnic identity, family/genealogy identity, and place/home identity. Although this example was based on the Chinese foods found in the US, the same patterns of food neophobic/neophyllic and food authenticities applies to other food traditions and place-based cuisines that have become a such a large and significant part of the complex tourist experience of destinations today. Food is one of the more comprehensible examples of the embodied experience of place and of the spectacle in every-day life that turns both outsiders and insiders into traveler. Tsai, J.L. ; Ying, Y-W. and Lee, P.A. (2000) The Meaning Of “Being Chinese” And “Being American” - Variation Among Chinese American Young Adults. Journal of Cross-Cultural Psychology 31(3, May): 302-332.